Panglao Island is one of the most popular, and fastest growing, tourist destinations in the Philippines, and Bohol International Airport on the island is preparing to open for commercial operations in Aug-2018. The new airport is expected to generate a significant increase in visitor numbers to Panglao as the island becomes more accessible, particularly for international tourists. Panglao attracts over 600,000 annual visitors, but only approximately one third of the visitors are foreigners. Panglao is a short drive from Tagbilaran Airport, which will be closed and redeveloped after the new airport opens. Tagbilaran is a much smaller airport and space-constrained because of its location near the centre of Tagbilaran, the capital of Bohol province. Bohol International Airport on the Philippine island of Panglao is expected to open in Aug-2018, replacing a space-constrained airport in the nearby city of Tagbilaran. Panglao is one of the most popular, and fastest growing, holiday destinations in the Philippines, but currently now attracts mainly domestic tourists. The new airport will make the beach resorts on Panglao more accessible and is expected to attract more domestic and international flights, compared to the current operation at Tagbilaran. Bohol is one of several new or expanded airports planned in the Philippines as part of the drive to boost tourism and promote alternative destinations. Up and coming destinations and new secondary airports in Southeast Asia will be a topic of a panel discussion at the CAPA Asia Aviation Summit in Singapore on 8/9-Nov-2018. For more details on the summit click here. The Tagbilaran Airport handles approximately 800,000 passengers annually. It is currently the twelfth largest airport in the Philippines based on seat capacity. Bohol International Airport will have initial capacity to handle more than 3 million passengers per annum. The airport is being built on a 230 hectare site with a 13,000 square metre terminal capable of handling seven aircraft and a 2500m night rated runway. There are already plans to extend the runway to 2800m after the airport opens. The new airport is reportedly nearly complete and will open in Aug-2018. An exact opening date has not yet been fixed but could be set with little advance notice as flights are simply being moved from the existing airport. The new airport is initially being managed by the federal government, pending a planned privatisation. Bohol International Airport expects to handle approximately 2 million passengers within the first couple of years, which would make it one of the ten largest airports in the Philippines. The airport should therefore support a large increase in visitor numbers for Panglao and Bohol province. Bohol overall attracted 1.1 million visitors in 2017, with more than half of them staying in Panglao. Some visitors to Bohol now travel via Cebu, the second largest city in the Philippines. The fastest ferry from Cebu to Tagbilaran is close to two hours. As more direct flights are launched, a smaller proportion of Bohol visitors will travel via Cebu. The Philippines has been promoting Panglao and several other alternative beach destinations as part of an initiative to boost tourism. Alternative destinations have particularly become important for Philippine authorities to meet its tourism goals for 2018 following the decision to close Boracay for six months, from late Apr-2018 to late Oct-2018. The Philippines is targeting 7.4 million visitors in 2018, which would represent an 11% increase over 2017. To meet this goal the Philippines needs to persuade approximately a half million visitors that would have gone to Boracay to try out other destinations in the Philippines. Boracay attracted approximately 1 million overseas visitors in 2017, along with approximately 1 million Filipino visitors. Panglao attracts over 200,000 overseas visitors per year. A large proportion of foreign tourists that were intending to travel to Boracay during the closure period have decided to holiday in other countries because most of the existing alternative destinations have limited capacity – both in terms of flights and hotel rooms. However new and upgraded airports, along with the promotion of alternative destinations, is an important long term investment. It will also take time for the new airport on Panglao to ramp up and attract flights, in particular international flights. As the new airport is opening only two months before Boracay reopens it will not likely benefit much from the closure of Boracay, which has impacted traffic at Caticlan and Kalibo airports. Cebu Pacific executives said during the group’s 1Q2018 analyst briefing that it was planning to move flights over from Tagbilaran and increase frequencies. Cebu Pacific executives said that Panglao had the potential to become the “next Boracay” after the new airport opens. Cebu Pacific currently operates three daily A320 flights on the Manila-Tagbilaran trunk route. Its turboprop subsidiary Cebgo also operates eight weekly flights to Tagbilaran with ATR 72s, including four weekly flights from Davao and four weekly flights from Laguindingan. The Laguindingan service was launched in Mar-2017 and Davao was added in Oct-2017. The two other main airline groups in the Philippines, AirAsia and Philippine Airlines (PAL), are also expected to move their Tagbilaran services over and increase frequencies after the new airport opens. PAL currently operates two daily A320 flights on Manila-Tagbilaran, and Philippines AirAsia (PAA) operates three daily A320 flights. The PAL Group (includes PAL Express) also operates one daily A320 flight from Clark, along with one daily Dash 8 turboprop flight from Davao. Clark was launched in Dec-2017, while Davao was launched in Nov-2017 and increased from four weekly flights to daily in Mar-2018. PAL also has the only international service at Tagbilaran – an A320 flight to Seoul which was launched in Jul-2017 and operates three to seven times per week (depending on the season). There are now more than 25,000 weekly seats at Tagbilaran Airport, which represents an all-time high level of capacity. The launch of five new services from the Cebu Pacific and PAL groups in 2017 is an indication of the surging demand for travel to and from Bohol, in particular Panglao. The PAL, Cebu Pacific and AirAsia groups currently have nearly identical domestic seat capacity shares (32% to 34% each) at Tagbilaran. When the only international flight is included, the PAL Group is the overall market leader by a slight margin. Note: some Philippine Airlines flights are operated by PAL Express. Airport and tourism authorities expect the new airport to attract several more international services. AirAsia, Cebu Pacific and PAL are all considering the launch of new international routes from Panglao, and PAL is also expected to transfer the current Seoul service to the new airport. South Korea is the second largest source market for the Panglao tourism industry, accounting for 19% of foreign visitors in 2016. China is the largest source market, accounting for 27% of foreign visitors in 2016. 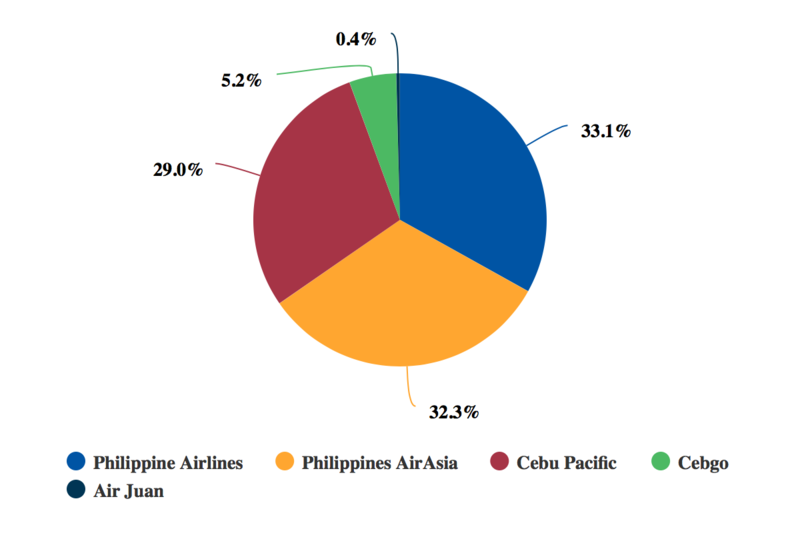 Flights to China make an obvious target because China has been the fastest growing source market for Philippines tourism overall. Chinese visitor numbers to the Philippines increased by 43% in 2017, to 968,000. South Korean visitor numbers were up 9%, to 1.6 million, as South Korea maintained its position as the largest source market overall. However, Panglao could be impacted by growing competition among Philippine airports for new international flights. Puerto Princesa on the island of Palawan opened a new international terminal in 2017, and Bohol is one of several new international airports currently under construction. On 1-Jul-2018 Mactan-Cebu International Airport also opened a new terminal, which will support further international expansion. Cebu’s international passenger traffic increased by 30% in 2017 and has doubled since 2014. The Philippines has several islands with huge growth potential, but historically most overseas tourists have focused on Boracay, Cebu and Manila. Other destinations such as Bohol, Cagayan de Oro, Palawan and Siargao have attracted domestic tourists, but accessibility issues have limited international traffic. The development of several new airports and expansion of existing airports is improving accessibility significantly. For example, there are plans for a second international airport in Palawan to improve access to the resort town of El Nido and the north end of the island. Puerto Princesa is a five hour drive from El Nido, which is famous for its beaches and dive sites. There are also plans to expand the airport at Siargao to enable jet operations and potentially international flights. The current airport at Siargao (which is known for its surfing) can only handle regional aircraft, but has experienced a surge in traffic over the past couple of years. Source: CAPA - Centre for Aviation & OAG. Opening more international airports is part of a government strategy to reduce reliance on congested Manila and to boost tourism. However, almost all international passengers will continue to arrive at Manila and Cebu, which currently account for over 90% of international seat capacity in the Philippines. Potential investors in the Bohol International Airport and other new international airport projects may be wary that the ambitious traffic projections may not materialise.